What Rezdy Triggers and Actions are Supported? 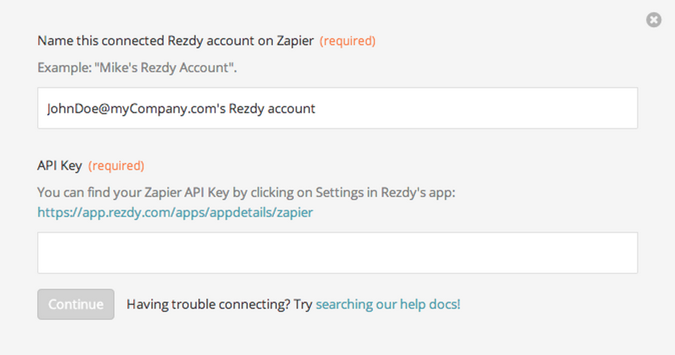 New Customer - Triggers when a new customer is created in your Rezdy account. Next we will ask you to give your new Account a name or label, which is just a handy name for you to recognize within Zapier. It doesn't matter what you name it, but it does matter that you paste into the API key field! As the final step, Zapier will automatically test that your API key is good and you'll be allowed to continue setting up your Zap. If all is good, you'll see the success message and you can continue setting up your Zap! We don't have any common problems documented yet, but feel free to contact us so we can help you personally! Rezdy is a cloud-based reservation software and booking system, designed especially for tour, activity, shuttle bus, rental and sightseeing operators.